One year ago, I was a night manager at a grocery store – and I was miserable. In April of 2017, I started a job with LongerDays, a virtual assistant company located in Downtown Muskegon, and with the possible exception of working at a movie theater when I was 16 (free movies, hours of downtime, all the popcorn I could want), I can comfortably say it is my favorite job I’ve ever had. I’ve learned a ton over the past year, and I thought an account of the journey so far would shed some light on what it’s like to start working here. It’s great, but it isn’t easy – and along the way I keep adding skills! For example: I’d never used a Mac aside from trying to get iTunes to play on my friend’s laptop at a house party. Now I use a Mac every single day, I even know some of the shortcuts! Do we hunt Death Eagles to extinction? Do you have a crushing will to defeat evil and fight crime by night? There was a place where you were supposed to attach your resume, but being mostly computer illiterate at the time, and filling it out on a tablet, I COULD NOT get a word document to attach! Considering how strange the entire application was, I thought maybe I was being trolled… And what do you do to a troll? Why, you troll them back, of course! 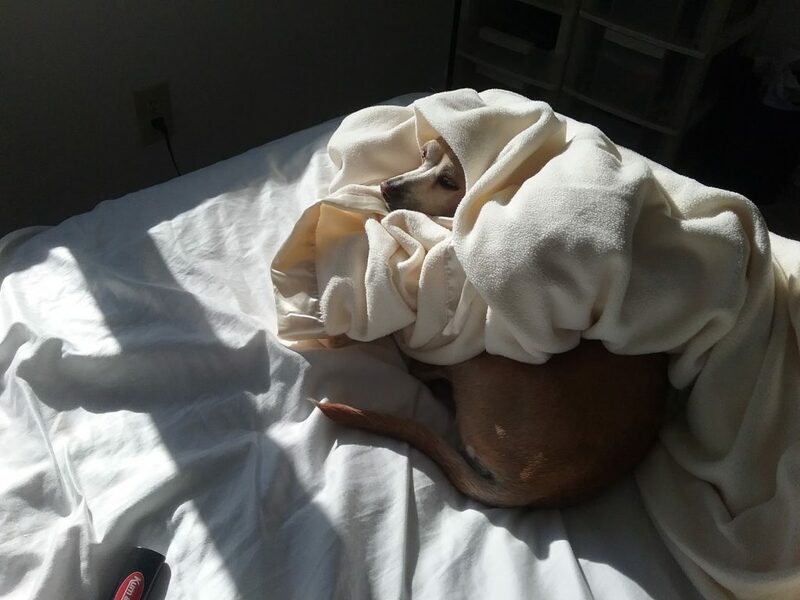 I attached a picture of my dad’s chi-weenie (a chihuahua/dachshund mix), Ginger, who had wrapped herself up into a blanket. I got an email from my old buddy Zahrt saying that, despite how much they loved the dog picture, they actually DID want a real resume. So, I garbled together another one (I’d deleted the first one in a fit of rage) and lo and behold – I got called for an interview! After an interview process that included listing off Lord of the Rings characters and talking about coin collections (and some serious things too), I was ready to start! The first week was a whirlwind: reading handbooks, trying to figure out what it is we actually DO here, and meeting my new coworkers. They were a mix of theater nerds, music nerds, and just plain old nerd nerds. I was finally home. There were so many different companies with different needs, I was SCARED. That first week, I read absolutely everything I could get my hands on. Phone lines were very stressful at first. I constantly worried that I would say or do the wrong thing, or even worse, someone would ask me a question I couldn’t answer. I was very lucky to be trained by our in-house phone guru. Lizze made sure that I knew everything that I needed to know, primarily to just trust myself. I’d already been doing customer service for years and years… I already knew how to deal with customers… I just had to remind myself of my experience and competence. We even have a great “process” for when we get stuck: Ask yourself. Ask Google. Ask the team. If that doesn’t get an answer, there probably isn’t one. As the weeks went on and I was added to more and more phone lines, I began to realize that I not only knew what I was doing, I was actually pretty good at it! I love the fast pace of jumping from a phone call about a hunting jacket issue, straight to a call for a lawyer, onto a phone call for a doctor’s office. The holidays were insane! People all over the country were buying our clients’ products left and right, and of course – with so many people coming together (or splitting apart) – the lawyer lines were blowing up as well. It was a shock how many people wanted a prenup for Christmas! Of course, nothing ran smoothly… There were all sorts of setbacks – shipping issues, secret discount codes becoming not so secret, stressed out customers on every line… Everyone was mad, and as customer service reps, we had targets painted on our faces. We powered through, and everyone here in the office did an amazing job. I’d been around long enough to make some really great friends, and I’m (almost) as grateful for them as I am for the paycheck! Having someone yell at you for something that you have no control over is pretty awful, but you can put up with just about anything if you have good friends to complain and laugh with… Especially if they’re right in the trenches with you. LongerDays is client-centric – they are the lifeblood of our business! While I’ve been working with different clients for the last year, I’d never managed a client of my own. The point person for each client is called a Team Lead, and it’s a big responsibility – and the natural progression of employment here. After one of my coworkers was offered an amazing opportunity, her clients needed new Team Leads. I was finally given a client of my own! I was incredibly excited. I’d been working on the project almost my entire time here, and the client is WONDERFUL. As I started to learn her business, I began to learn a little more about myself as well. It turns out I really like making my client money. To follow a “deal” from the beginning to the end, and to watch that money get deposited into the PayPal account is rewarding! Knowing that I’m an integral part of the entire process is so exciting! I’m so grateful for this job! it has been so long since I truly enjoyed what I do to make a living. Granted, this job doesn’t have unlimited free popcorn like the movie theater, but we do get lunches provided on Friday… And on a non-food related note, I actually feel fulfilled by my work. My next steps are to use my new found knowledge (of myself, of software systems, of overall operations) to help not only my clients, but the internal success of our company as well! It’s been a hectic, educational, and enjoyable first year at LD, and I’m excited to see what the future brings!